Being that NFL football season is now in full gear and men everywhere will spend their Sunday's glued to the TV for close to 8 hours, I thought I'd hit you with my favorite football movies. Football is the biggest major league sport in the U.S. and drives thousands of wives crazy every sunday while their husbands schedule their sundays around watching football. So when the games on Sunday and Monday have ended, what's better than watching some great football movies. Here's 10-6 of my Top 10 Football Movies! 10. The Replacements (2000) While The Replacements is hated by most, I actually enjoyed it quite a bit! 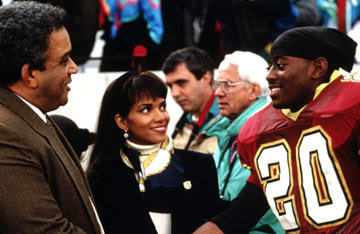 The film is based off the 1987 football players strike and is filled with hilarity and hijinks. Keanu Reeves actually provides some great scenes even with his monotone vocal delivery. Jon Favreau plays a reserve linebacker who is more than chomping at the bit to get on the field and always makes me laugh everytime I watch. Gene Hackman is great as coach Jimmy McGinty who tries to make something out of nothing in the remaining four games to the season. 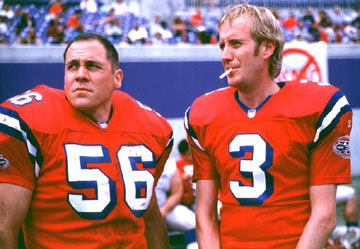 If you've never seen The Replacements it is definately worth a watch. 9. Wildcats (1986) This is the first football movie I remember seeing as a child. Goldie Hawn plays a high school football coach that must deal with a very rough group of players. Highlights to this film are the first time Wesley Snipes and Woody Harrelson shared screentime and where the two developed a friendship that would result in further movies. Wildcats is filled with loads of laughs and a nice shot of young Goldie Hawn's chest in the bath tub. For those that love comedy and football, Wildcats is not to be missed. 8. The Program (1993) The Program for its time was a very good serious film surrounding college football. James Caan stars as the coach who tries to juggle all of the different players and their different struggles of playing college football. Upon its release The Program recived a ton of flack, when a group of teens tried to emulate a scene from the film. In the scene the offensive line lied down in the center margin on the highway in between opposing traffic. The scene was later removed from the film and has never resurfaced. The Program is a great watch anytime it is on and features a young Halle Berry and Omar Epps. 7. The Best of Times (1986) The Best of Times is a great dark comedy that feature Kurt Russell and Robin Williams brewing over old rivalries from a lost football game some twenty years prior. 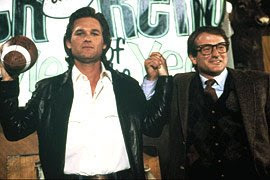 Kurt Russell plays Reno Hightower, the once famed Taft High School star quarterback, while Robin Williams plays Jack Dundee, the player who blew the biggest game of their career's. In the film Jack is determined to have one more shot at the big game and actually win the game. The film has some great laughs and see's both Russel and Williams early in their careers. 6. Varsity Blues (1999) Varsity Blues is a fun and enjoyable high school football movie that stars James Van Der Beek as the backup quarterback who is given a shot at the bigtime when the all-star starting quarterback (Paul Walker) has a season ending injury. Jon Voight plays the loud-mouthed coach who is more than willing to risk his players careers to serve another championship for the small town Texas team. Amy Smart, Scott Caan and Ali Larter also star in the high school football movie. If you have never seen Varsity Blues, check it out, you'll enjoy.